What are some differences between monocots and dicots? Monocots and dicots are two major types of flowering plants. They can be distinguished by the number of first leaves (the cotyledons) that emerge from the seed during germination. The number of first leaves is also name-giving (“mono” meaning one and “di” meaning two). The mono-cots (also known as mono-cotyledons) form one first leaf, while the dicots (dicotyledons) form two. Mono-cots and dicots have other distinguishing features, such as the arrangement of leaf veins or the number of furrows or pores in the pollen. 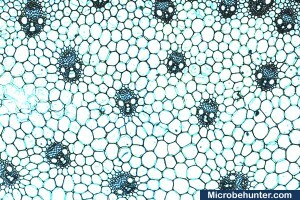 One significant difference can be observed microscopically: the vascular bundles (the cells that carry water and nutrients up and down the stem) show a significantly different arrangement in these two groups. Monocots have the vascular bundles scattered randomly throughout the stem. The vascular bundles of dicots are arranged in concentric circles. The top image is maize, a monocot. The vascular bundles (they look like little faces) are distributed randomly in the stem. 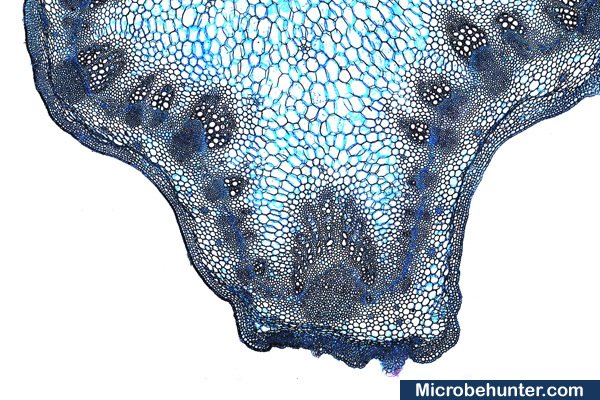 The second picture is the stem of a sunflower, which shows a different arrangement of the vascular bundles (located towards the outside.